I grew up in a house hold of 5 kids and two super parents. My father is the loudest and most kid like out of the whole family. He grew up in a house of 9 kids and two strong parents. If you have a large family you know what its like trying to be heard especially when you are the baby. 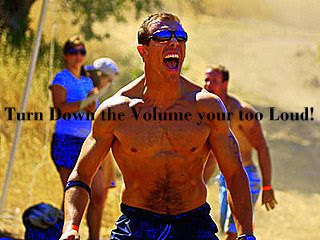 So I know I am loud, obnoxious, over the top and annoying when it comes to working out or being in the gym. I am sorry but I am not. We live in a culture where you must be civil domesticated and proper. I do that 14 hours a day, so I am going to take a few for myself to express my loud mouth with some grunts and yells! Again I know, I know its to loud over the top crazzzzy!!! !